Don't get duped by a PHISHING scam. A phishing scam is when someone attempts to acquire your personal information by pretending to be a trustworthy entity in an electronic communication. Phishing messages usually do not address you by name, but use a generic greeting, such as "Dear User" or "Dear Customer." Threatening language such as "Your access will be revoked if you do not..." or "Your account will be terminated if you do not..." is often used to elicit a response from you. If an email has a link, be cautious. If you're not on a touch device, hover over the link with your mouse. Does the URL displayed match what you're expecting? Never log into a website that's not secure -- look for "https://." The largest propagators of phishing attacks are from Russia and China where English is not their first language. Use this to your advantage by spotting poor grammar and misspellings as a red flag. For example, if you don't bank at Wells Fargo, don't fall for a phishing message "from" Wells Fargo. The telltale sign of a phishing message is the request for personal information. Legitimate institutions should never ask for your personal information via email. Can you spot the phishing signs? Click or hover over the areas with dashed lines to read a description. We regret to inform you that your account has been restricted. To continue using our services plese download the file attached to this e-mail and update your personal information. Subject: Letter From Auburn University !!! You have 1 new Security Message Reference for your account! Copyright © 2014 Auburn University. If you have reason to believe that the request is real, call the institution or company directly. If you have reason to believe the request is real, type the web address for the company or institution directly into your web browser. In the event you do fall victim to a phishing attempt the thieves will try the compromised password in as many places they can. If you suspect any account you have access to may be compromised, whether it is your AU account, Facebook, bank, etc., change them all. It may be easier to miss telltale signs of phishing attempts when reading the email on a smaller screen. 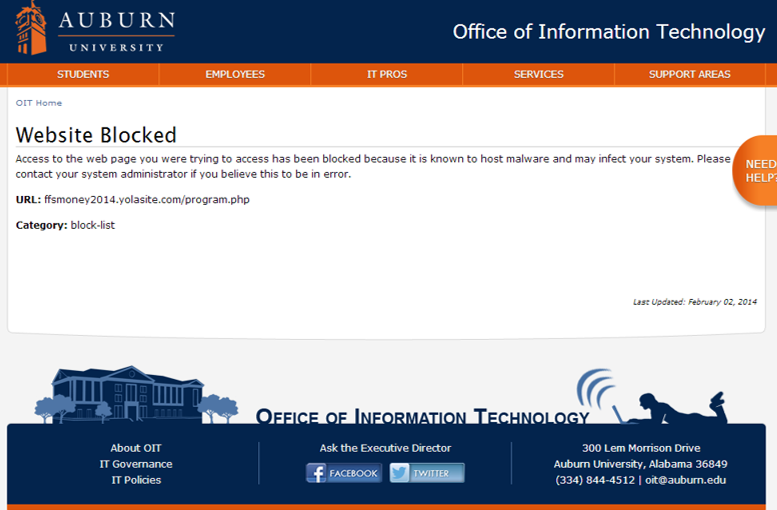 Menu > Settings > Show advanced settings... > Check "Enable phishing and malware protection"
Tools > Options > Security > Check "Block Reported Attach Sites" and "Block Web Forgeries"
Settings > Preferences > Security > Check "Warn when visiting a fraudulent website"
If you ever reach a page like the one shown below while on the Auburn network, that's OIT helping you to not get phished. OIT currently blocks ~4,000 websites, which also includes entire domains. Google blocks 10,000+ phishing/malware websites every day. If you run across a website like the one shown below, that's Google looking out for you. You can report phishing scams to the company that's being spoofed. 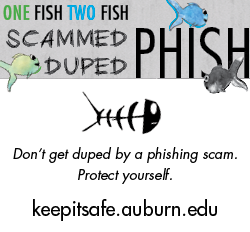 Help Auburn's email phishing filter work better by forwarding fraudulent emails to: phishing@ciphertrust.com.